Potatoes originated thousands of years ago in the Andes Mountains of South America and have become the world's fourth largest food crop, after rice, wheat, and corn. 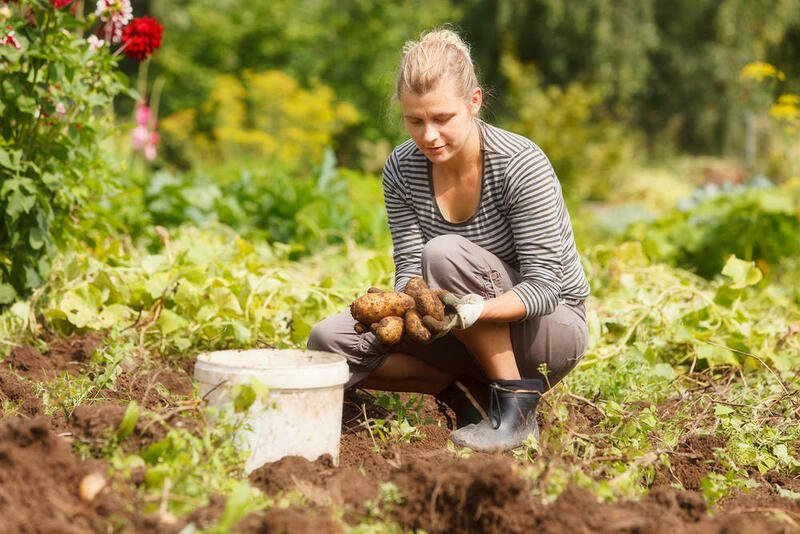 Potatoes are not a common crop in home gardens because they remain in the soil for about 20 weeks before they can be harvested and take up a lot of space. They can however be grown successfully in containers; and a small patch of baby potatoes can be harvested much earlier and is well worth growing because nothing compares to the flavour of a freshly grown new potato. Brightly coloured petunias are perfect companion plants for potatoes and act as a tonic plant; and caraway will improve their flavour. Planting potatoes with beans will help to keep beetles away. Potatoes also grow well near spinach, kohlrabi, pea's eggplant and mint. Potatoes do not grow well near tomatoes, beetroot, cucumber, pumpkin, squash, celeriac or table celery. Potatoes dislike cold conditions and are sensitive to frost; they also dislike excessive heat. For home gardens the best time to sow is in early spring or autumn, depending on climatic conditions. It is best to plant special seed potatoes but if these are not available you can practice "chitting" your own. "Chitting" is the term used to encourage the growth of the shoots on seed potatoes before planting. This will produce heavier crops than would otherwise be obtained. Do this by placing your seed potatoes in some cardboard egg boxes with the thickest end facing up and keep them in a dry, well-lit, frost-free position. After about 4 to 6 weeks the growing shoots should be 2cm tall and ready to plant out. To encourage early seed potatoes to produce large potatoes, remove all but three or four sprouts from the tuber before planting. For larger plantings buy certified seed or tubers as potatoes can suffer from serious fungal and viral diseases. Tubers for planting should be about 60 grams in weight; large tubers can be cut into sections, providing there is at least one eye or sprout on each piece. Potatoes need deeply dug soil, about a spades depth. The ideal pH is 5 to 6.5. Break down all clods of soil and remove all stones etc. If you are only planting out a few plants, dig a trench about 15cm wide and 15cm deep. Add some compost until you have a loose, crumbly soil and add a dressing of 2:3:2 fertilisers. Return some soil to the trench and plant the tubers about 25cm apart and cover with soil. If you have more than one row, allow 80cm between rows. Once the shoots emerge and are about 30cm tall, make a mound of soil around them. This protects the tubers from heat and caterpillars. Keep on ridging the soil up against the stems to encourage the development of more tubers. Keep the plants well watered and water in the mornings; allowing the leaves to dry before nightfall. This will help prevent fungal diseases. If the beds are prepared correctly it should not be necessary to feed again. New potatoes should be ready to harvest about 3 to 4 weeks after the plants have flowered and the leaves turn yellow. Carefully loosen the soil with a fork on the sides of the ridges and gently lift out the tubers. If space is limited you can grow potatoes in a barrel or similar container. Any sort of barrel can be used and ideally the container should be about 1m tall, although smaller containers like plastic dustbins will suffice but the yield will be smaller. Ensure that the container drains well and is clean, before planting. Remember that the barrel will become heavier as the potatoes grow and compost is added, so choose a sunny, sheltered position where it can be left until the crop is ready to harvest. Cover the bottom of the barrel with about 5cm of stones for drainage. Cover the stones with about 12cm of compost mixed with a good general fertiliser, add another layer of compost 15cm thick. Plant your seed potatoes with 15cm between each one as well as the sides of the barrel. Cover with more compost leaving only the tops of the shoots open. Keep the barrel well watered but not waterlogged. Feed regularly with a fertiliser high in potassium like 3:1:5. As the potatoes grow within the barrel, add further layers of compost and continue adding compost until the compost reaches about 5cm from the top of the barrel. Add some stakes into the top to keep the plants from drooping over the side. New potatoes should be ready to harvest about 3 to 4 weeks after the plants have flowered and the leaves turn yellow. Tipping the barrel onto its side should make the harvest easy. Watch out for cutworms. Leaf beetles and potato ladybirds can reduce your leaves to lacy holes. Spray with an organic insecticide for chewing insects. If your tubers have holes in them, tuber moth larvae are the culprits; ridging the soil up against the plants will help prevent this. Late blight causes the leaves to develop black marks with yellow outer rings. This is very difficult to control but can be prevented by spraying the plants regularly with a fungicide. Never plant potatoes in the same bed next season or in a bed where tomatoes have been grown. Developing potato tubers which turn green because they have been exposed to light are poisonous even if they have been cooked and should not be eaten. Post your gardening questions below!